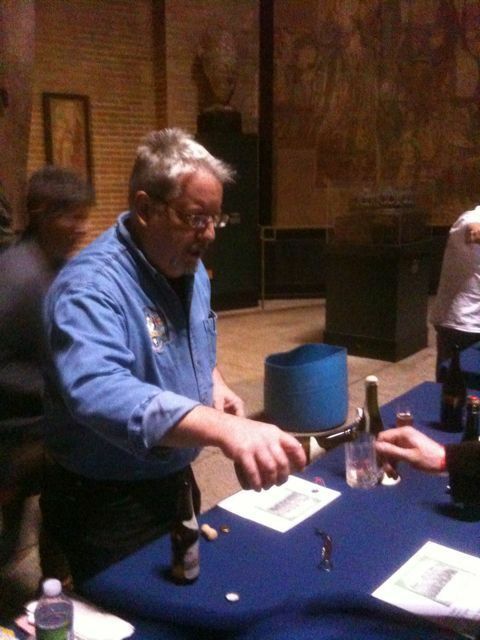 The X Fest was a really nice Christmas Beer tasting event held last Friday night at the Penn Museum. Joe Sixpack (Don Russell) and the Philly Beer Week crew put together some great winter brews at the site of the old “Book & Cook” beer tastings at Penn. Unlike those events, you could actually hear yourself speak Friday night and access the beers you wanted pretty easily. Not that it was empty by any means. I had the pleasure of chatting with local beer luminaries beer historian Rich Wagner, author and all around beer expert Dale Van Wieren and beer bon vivant Woody Chandler. Don was there pouring and tasting beers, as well as sharing his thoughts on the beers themselves. Cloves and cinnamon in your beer not to your taste? Well there were plenty of others like Bar Bar (honey beer) and a hard to describe but kicking Jolly Pumpkin winter ale that would warm you without the spice. I think Ill make the XFest a new BeerAppreciation holiday tradition!